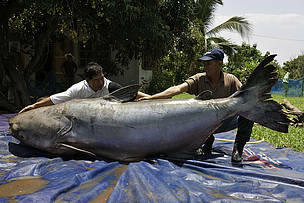 The Guinness Book of World Records lists the Mekong giant catfish (Pangasianodon gigas) as the Earth’s largest freshwater fish. Reaching a maximum length of 3 metres and weighing up to 300 kg, the species is unique to the Mekong River where it migrates huge distances to spawn. Just one century ago, the Mekong giant catfish was found in relative abundance within its range, in the Mekong and major tributaries from Vietnam to southern China. However, infrastructure developments such as dams have blocked important migratory routes to spawning grounds. So too overfishing has reduced the population to critical levels with an estimated 90% decrease in the past two decades. Efforts to save the species hinge on several factors, including how well biologists understand the ecology and behaviour of these animals. Research is currently being undertaken to build up knowledge and address some of the big questions that will determine its survival. 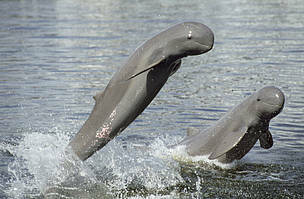 The Mekong River Irrawaddy dolphin (Orcaella brevirostris) population inhabits a 190km stretch of the Mekong River between Cambodia and Laos. There have been serious declines of this cetacean throughout its natural range, which stretches from Bangladesh to Indonesia. The Mekong’s freshwater population now stands at between 78 and 91 individuals. Although the Irrawaddy dolphin is not directly exploited, it is exposed to incidental mortality in fisheries, such as being caught in gillnets set out to catch fish. WWF is currently helping Laos to coordinate conservation efforts by raising public awareness, assisting in responsible tourism, and conducting research activities to better inform conservation planning. At half the length of a bus, the giant freshwater stingray (Himantura polylepis) may be the largest freshwater fish in the world today, with a maximum weight of 600kg. It was first observed in 2004 but was only confirmed as a new species by researchers from WWF-Thailand and the US-based Smithsonian Institute in 2006. The species is known to inhabit estuaries and large deep rivers, burying in sandy or silted river bottoms, to lie in wait for unsuspecting fish, clams and crabs, using a sensor that can detect an animal's electrical field. Populations of this stingray are faring better than other Mekong megafauna, and experts suggest this is because of the depth of the river they inhabit make them harder to catch. 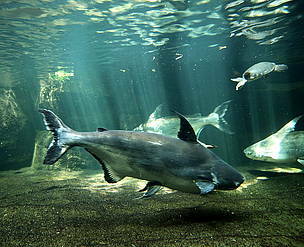 Known to feast on the carcasses of large animals, the 300 kg Giant dog-eating catfish (Pangasius sanitwongsei) is one of the largest freshwater fish species in the world. It is almost exclusively found patrolling deep water and large rivers across the Greater Mekong region. It usually feeds on small fish and crustaceans such as shrimp, but also eats larger prey, even dogs. The lifespan of this catfish in the wild is unknown, but in captivity it has lived until 20 years of age. Major threats to it are overharvesting for local and commercial fisheries, habitat loss and pollution. 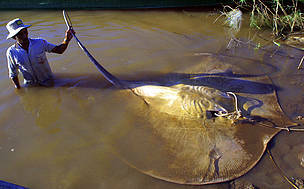 Giant freshwater stingray is one of several gigantic fish species inhabiting the Cambodian section of the Mekong River.